The making of Spice Invaders : On5. We make mobile games. In just few days the world will see our game Spice Invaders. We are very excited about the launch here at On5, and even decided to write a big “making of” post which will show how we did this game. It all started back in march 2010 (almost 2 years ago, hard to believe how long ago that was) when we were thinking about making a new game. There were no tower defense games in the app store which were both interesting and beautiful (maybe we just didn’t find, who knows). On top of that, there were no multiplayer TD strategies at all. 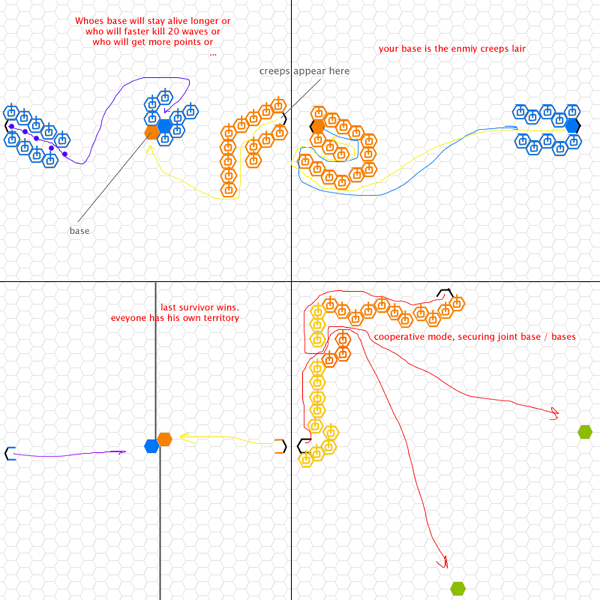 This is a very early sketch of the planned multiplayer modes. 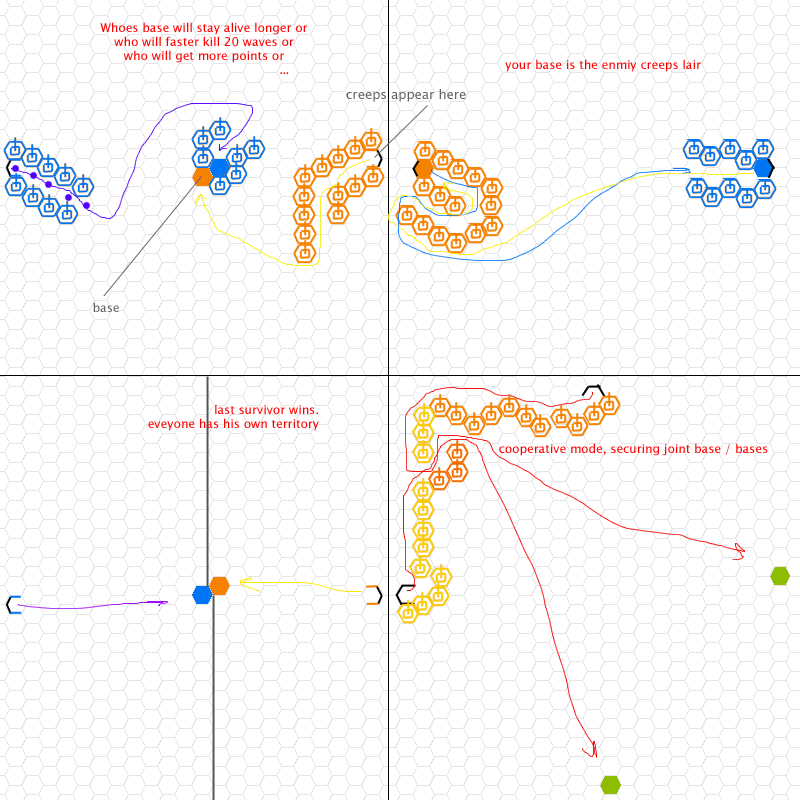 Three of them made it to the final version: competition, camps, and cooperative. And the code magic began. Step by step in pretty short timeframe we’ve got ready: basic gameplay, level editor, and a few testing levels, so the game started. Also we were playing around with the assets, choosing the final style for the graphics and thinking about the storyline. The first tower took longest to create (take words “sketch”, “render”, “discuss” and “reject”, mix them in any order 10 times and add “eveyone is happy” in the end, that’s how it was). Here are just some of variations we had in the works. If we spent the same amount of time to polish each tower we now have in the game, we would still be pretty far from completing anything. But luckily, all other 53 towers (6 types, each type has 3 development lines, and each line has 3 upgrades which is 54 possible tower upgrades) were created much faster. We actually revised some towers a few months after, but that was just our will of perfection. We created a huge load of maps: about 80. Only 58 best ones made it into the game. Planning to add more in the future. We’ve also worked on creeps (the enemy units you defend your bases from). Same thing happened there. We wanted to find a unique post-apocalyptic style for humans, futuristic but not fancy at the same time. Soldiers, robots, tanks, planes. Done and redone a number of times 😉 In a few months we decided to add more creeps, and colored the existing ones too. It worked perfect. By design humans had to be technological, not fancy, in contrast to the pirates who are pretty and kind of old-school. 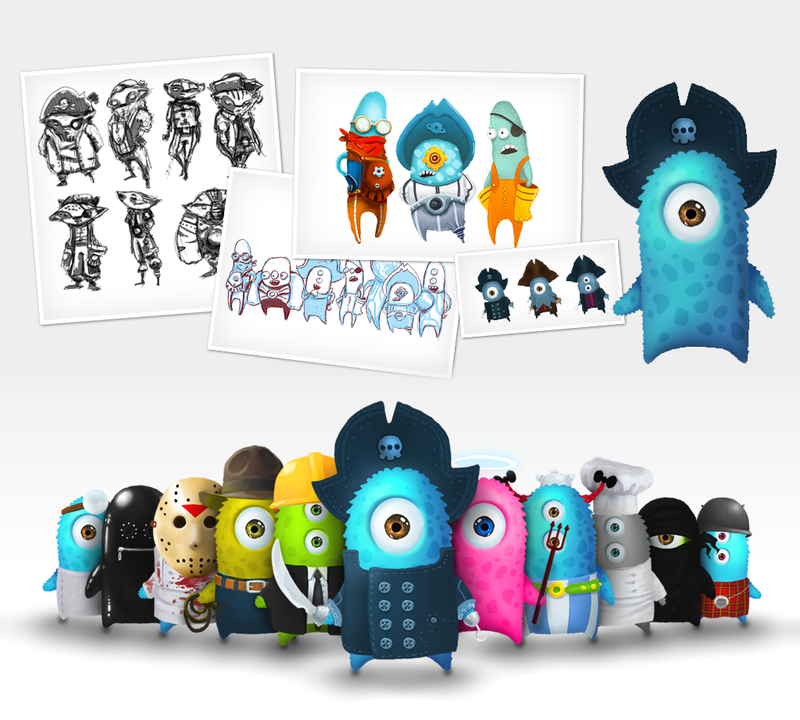 We’ve selected steampunk as the style for the towers (however not so much left from the initial feeling of steampunk we had in earliest sketches) and cute style for the main heroes, our pirates. Hard to say who exactly they are, but we called them mini-bears at some point. So.. here we go. Meet the team! Ever wondered what a nuke consists of? Well, it starts with an egg. Then you paint it like you do for Easter. Add a couple of stabilizers, and here you go: a nuke. 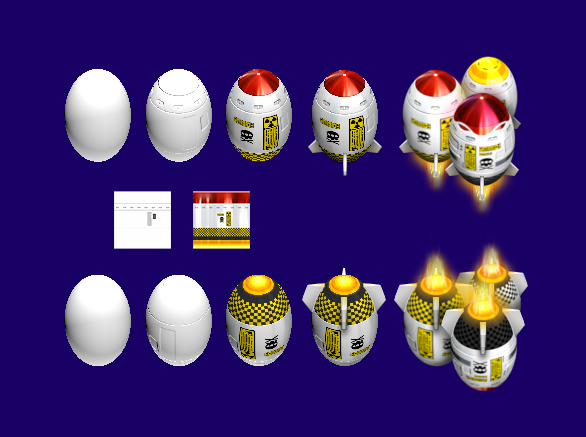 We have three different nukes to choose from in Spice Invaders, each with its own look. A game like this needs the main menu. The idea was pretty simple. Main guy (the player’s character) is standing on the stage like a boss. Menu items are on the right in a spice tank. Everything is simple and straightforward: Sketch, cleanup, draw, adjust, cut, integrate, animate, fix issues on different devices (if you call that simple…). We also added the player’s friends with their stats to the stage later. Now it’s social. Need an icon? 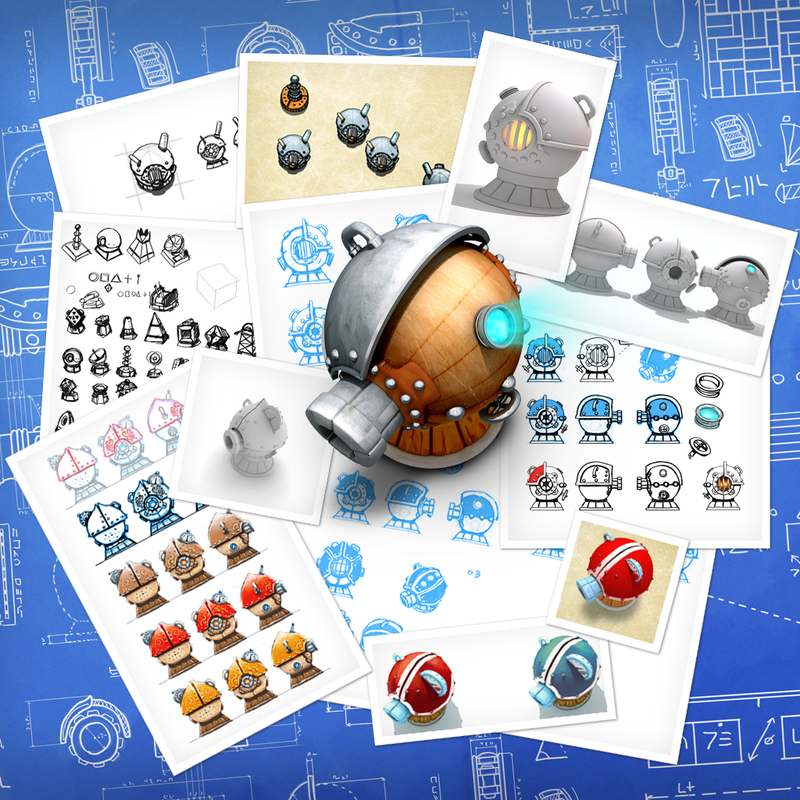 No problem, our artists just created about 50 variants to choose from! 🙂 A bit too much. It ended up having a global poll in our office and at Chillingo to choose which one is the best. We think we selected the right one. When you tap the icon for the first time you see the introduction movie which shows who the pirates are and what they are up to. You probably already saw this movie in the trailer. Here is how it was created. 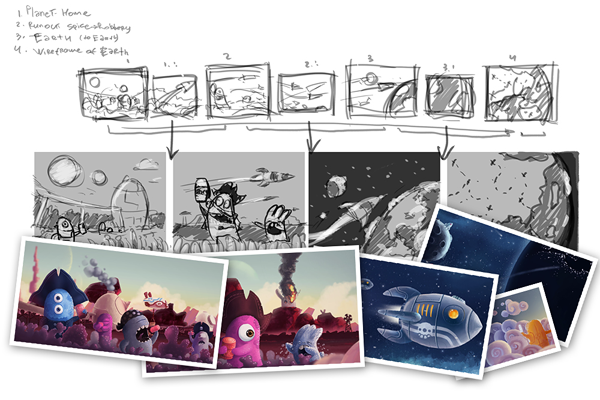 From the idea to concept art to finalized artwork. Actually the entire world shown in the video, from the first pirate with a can of spice to Earth is a single very very wide scene. At least that is how it was drawn. 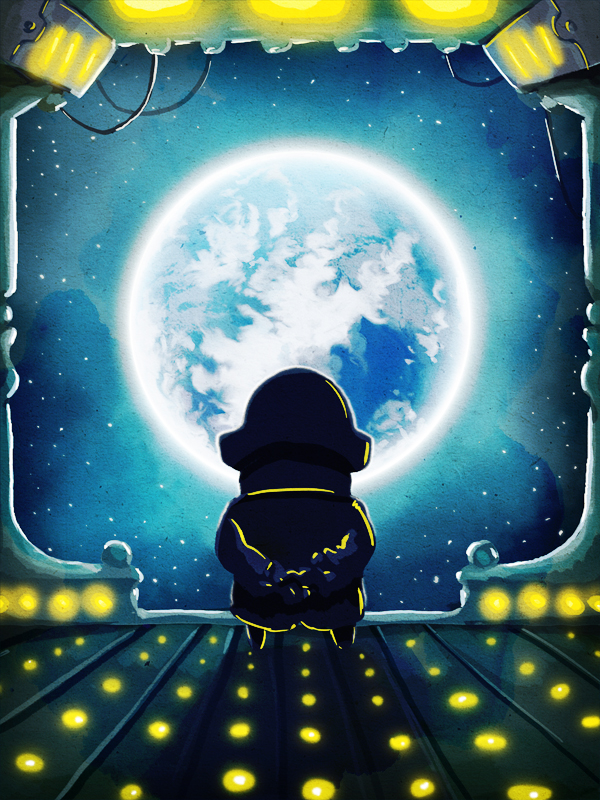 We were working with Chillingo as the publisher for the game. People there really know what they do and gave us lots of great advices on how some things should be done and how other things shouldn’t be done. Great experience. Thank you guys! Sometimes when you are really passionate about what you do, you can’t notice the flow of time. When development was completed, we calculated the time spent. We spent about 11000 hours in total, making this game. Artists, engineers, sound designers, producers, etc. It costed us a lot more money than we expected. But the idea was simple: either make this game the best in its genre or just not do it at all. Whatever it took, we did it. The pirate fleet is waiting for a signal to start the invasion. Spice Invasion. Well I will totally and 100% be mashing the BUY NOW button in the App Store as hard as humanly possible. Anyone care join? Work of 21rst century art, awesome job! Love the design, it looks clean but full of character. Really digging it! The app icon is good too, but I do disagree with app icons that have the apps name as a main constituent of its design, because the name will be below in the app label. Only a personal opinion, still buying this as soon as it’s out. УРА! Молодцы! Ждём с нетерпением. Может выложите больше скетчей? Выглядит потрясающе, очень приятно наблюдать работу профессионалов. Хотя бы на лепре.. Surprise! The game is going to be FREE! The icon is kind of old school, yep. And thanks for the note. Updated! Your right two years ago there were no good tower defense games at all, but recently Kingdom Rush got ported to iOs and it will be a very though challenge to beat this tower defense game, Kingdom Rush is ranked #1 both on armor games and kongregate and is on the top charts of the app store as well! You guys should try playing kingdom rush too, it’s the perfect fit for a tower defense game, will be hard to top that! My tip for the developers: remember that Quality is more important than Quantity. Most of us rather would play 12 detailed and polished stages rather than 58 plain and boring levels. (I would rather prefer separate versions, HD for iPad) Curse you auto-correct… LOL. Sara: Why should they try to “beat” Kingdom Rush or any other TD game whatsoever? More quality TDs – better for us. And, in fact, Spice Invaders is now amongst the best out there. I’d prefer not to compare which one is better, cause even being of one genre – good games always have something personal and innovative. As Spice Invaders certainly do. There will be just one universal version. 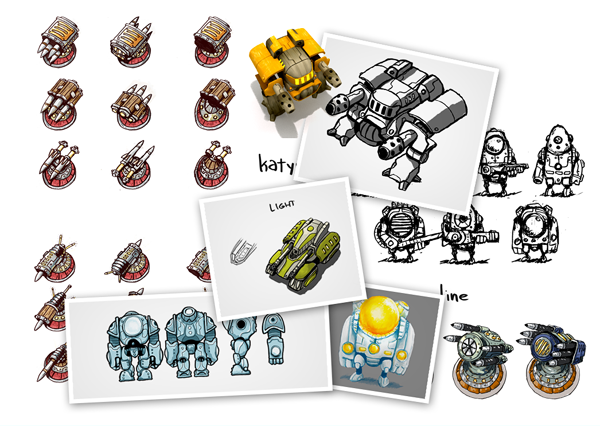 We played lots of TDs prior to starting the development, in the middle of the process and after Spice Invaders were finished too. Most of our team loves TD genre, so we keep exploring the genre just for fun. 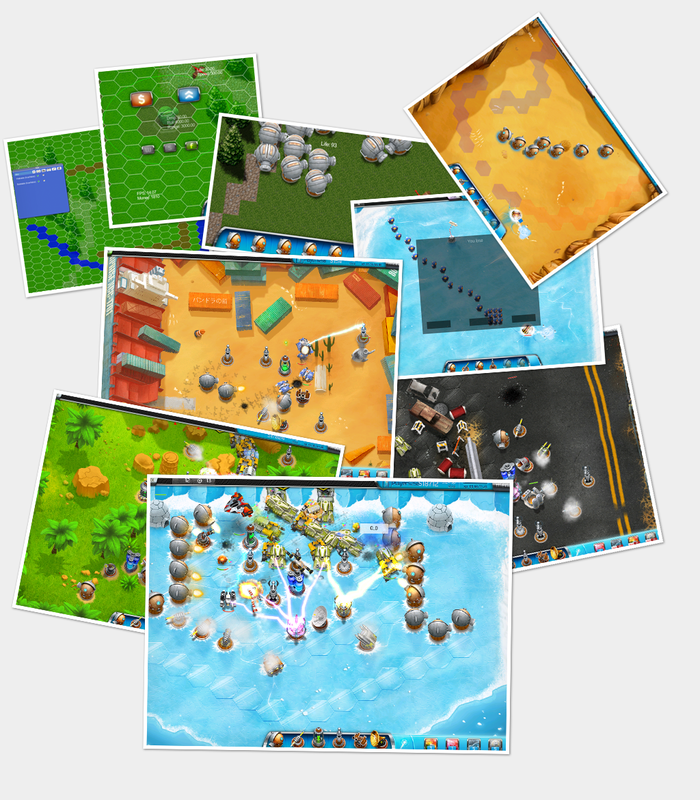 And yes, we are targeting quality, not quantity, that’s why we decided to create just 55 levels instead of 100 planned. It will be great to hear your opinion after you check out the game. You should read their post more carefully! Direct words from On-5 “But the idea was simple: either make this game the best in its genre or just not do it at all. Whatever it took, we did it.” By that sentence you can assume that Spice Defenders needs to beat every TD game to get to the top of TD genre or they wouldn’t have spend their valueable time to make it. On-5 words not mine. My point was that it won’t be as easy as they think cause Kingdom Rush is already a very tough competitor, but hands down I agree with you that the more quality tower defense games the better. Another question to On-5 about Spice Defenders! Will we need to sign up (as in username and password) in order to play online? If so will we be able to use our Charadium II accounts (as in username and password that we use to sign in to Charadium II to play) or will we need to create a new account in order to play Spice Defenders online? You can create an account in Crystal mobile social network if you’d like to change your name etc. Accounts from Charadium are not connected to Spice Inavders accounts. Love the whole map area. But,I’m obviously missing something probably obvious– the cadet training. It says select it on the map but I’m not seeing anything. Edit: I just needed to restart my iPad. Works great. Really cool game! First of all: Absolutely love the game. After getting hooked on Tower Defense games through Kingdom Rush and Sentinel 3, I’ve been searching the app store for the next great quality TD game, and after several disappointing purchases, I was thrilled to find Spice Invaders. However, I just wanted to mention one major issue that hopefully can be changed in a future update: why can’t you list a breakdown of the towers’ statistics? Either as it’s own section or included on the Tech Upgrade screen? It’s a pretty standard feature on games of this type, and although you have the stats listed when you select a tower during gameplay, without a pause button it’s difficult to really take the time to examine and compare a tower’s statistical strengths/weaknesses. Anyway, thanks again for th brilliant game, and I look forward to future releases! I noticed that you can get a star in each of the game modes (the star will appear over the icon of the each game mode in the world map, assuming you earned it) Care to explain how do stars work, cause I got some on some modes and didn’t get some on other stages same modes. Did anyone clear the Morumbi Level (Football Stadium) yet?! Nevermind figured out how to get the stars myself, in order to get a star you need to clear the mode without letting your base take any damage. However The Line Camps (with 5 players) is impossible to clear without taking any damage because the bases are too close to each other and once Aircrafts come out you always get damaged cause bases are too close to each other. How are you supposed to get a star for not taking any damage when Aircrafts spawn right next to you from an enemy base ? Nice game played it, but just got kicked out. Now i cant select any levels in the map. So cant play no more. Исчезли абсолютно все скиллы на 42 уровне. И нет ни одного апа( А уж про полоску друзей вообще молчу – при попытке кого-то пригласить отображалась лишь часть друзей, потом в разделе Career стала отображаться лишь часть друзей, с середины сегодняшнего дня все стало в порядке. This is the best and only fun TD game on the App store. Best game to come out for Ipad period in the last year. RPG elements and lots of fun modes and MP. fantastic game!! really awesome! I have a question! what is the ‘w s f’ button of tower? Hey, what does the W F S or whatever buttons under the cannons do? I’m too much of a chicken (lazy etc) to figure it out in game. Man that soccer statium is bloody killer. Great game, but i can only play offline, game keeps telling me to connect to the internet. I am definitely connected? Help please? 1: how do the medals work? I have completed much more than 10 missions on normal but I still don’t have that medal. 2: sometimes when I run the game the towers are normal price despite the fact that I have maxed out the %discount in the upgrades yard. But i just found out my upgrade points has vanished!! There was some unusual game play. The loading of the game was taking too long. So I exit the game, and run the game. After that my upgrade points were gone. Please, fix this problem for me. After this problem, I almost lost my motivation to play this game. Please fix Line Camps, Impossible to win without taking damage (in order to get a star), because the Aircrafts spawn too close to your base (they simply just spawn and instantly shoot,which is not fair to begin with), I tried every tower combination, even tried freezing and disco magic, but even if you use freeze the Aircrafts stil manage to hit you with a few missiles and you won’t get a star. This makes me sad, because the game clearly hasn’t been quality tested enough, cause if it was there wouldn’t be a stage that’s impossible to get a star from! PS: I’m level 40 tried to get a star from the Line Camp Mode 300+ times! the beautiful tower denfece game on my iPad. and i feel it a bit difficult. Game developper myself, your game is nearly perfect in all domains. Stand up and applause! Loving the game, but i want to start over to repurchase upgrades! How is this possible? Love the game but at major rank all my uppgrade points dissapered at the uppgrade yard, everything reset to 0 level to 🙁 anyone with the same problem??? Just noticed that achievements don’t seem to be working. I’ve achieved a number of them, but hasn’t moved past 12% completed for quite a while… feel free to get in touch via email if you want to troubleshoot/details. Love the game so far, though… probably my favourite TD game to date. Great job! Anyone knows the email adress to tje support? Really addictive .. love the game play!! Just hoping that this will remain free!!! what mean buttons S, W, F in almost every armor’s settings? Pressing them doesn’t have any noticeable effect and there is no help or other ways of learning their meaning. I’d appreciate if you shed the light on it. That being said, they don’t consistently seem to do as I expect, either… unless fastest doesn’t mean “closest” (which would be more helpful). Closest -> Furthest (Small, Wide, Far) was my original guess. Which would be incredibly very helpful, particularly with things like Duke Nuke… which covers the entire map on almost every map. Having 2 of them at different distances and set on “Small” instead of them both hitting the same spot would be good indeed. Can a dev give us a definitive answer as to what they do? Any word on a fix for losing all progress and spice points that I bought? Would lobe them back at least. seem to have fixed it along with the name change to spice bandits. hope you guys can make a forum or a site where players can interact, or maybe add a chat box or something in the waiting room, but other than that, effing awesome game!!! Could you please show the stats of all the towers and their upgrades? I’m currently playing the game but I keep wasting spice on towers i dont want and i would appreciate it if you could 😛 THANKYOU! the ammo supply doesnt affect nukes? or its a bug? Hey. Now I collect my spice until200 but now it gone.I don’t know how it gone. Today I play and my spices are vanish. Please help. Last night when I went to bed I had 98 spice and was planning on buying some upgrades in the morning. I wake up today and I have 0 spice.. What is up with that?!? I really feel cheated and would like to hear how I can have my spice back.. Thanks. Exact same as Chris above, I think I had about 120 spice last night and when I switched on today… 10!!! Did everyone just lose 20+ games worth of spice overnight? Love the game, but that really sucked! Please give me it back! Like above. Last night I have about250+ of spices. I decide to upgrade my tower on Friday. But this morning, it was gone I need it back. However it a good game. Please fix it and give my spice back. Space pirate can’t live without spice. Some users may observe problems with their spice balance. This is a temporary issue and we are working to resolve it. Spice balance will return back to normal within 24 hours, no spice will be lost. Thanks. I love this game. I have never been hooked on any game like I am Spice Bandits. Three cheers, gentlemen – I can’t wait for updates! Any idea why the name was changed from Spice Invaders to Spice Bandits? Is it because of some kind of copyright infringement?? How do I move my gameplay stats from one device to another ? I started the game on my old ipad2, did a backup and restored it on my new ipad. Gents, incredible game, but I have to repeatedly try and load it now…crash aftr crash. I’m on th original iPad. theraprasa, donutter – We are really glad that you are enjoying the game. Thank you! Mischurke – At the moment you can transfer your data only through Crystal. Sa – Where does the game usually crash? Great text! I’m really excited about this game. I always liked tower defenses from Warcraft 3 engine but no game had the potential to grant a great gameplay. I’m downloading this right now, thanks for the effort and congratulations for all the work you guys had! By the way, i suggest you explain that the name has changed, I was searching for it on app store but couldn’t find till i checked out the comments. Really love this game! hope it will become more and more popular. by the way, can’t wait to a new update version! Да, это лучший TD, который мне доводилось видеть на iPhone. Играю уже долгие месяцы, будут ли новые башни? How can I delete friends in the game? A have a lot of them but some have noot been online for long. Because of this sometimes I do not see those people who are online. And I have the issue with medals – I`ve passed all locations and all games in them but I still see trip medals (win 10/30/60 games in all modes) not opened though I passed all the games in normal, sudden death and air attack with a star.